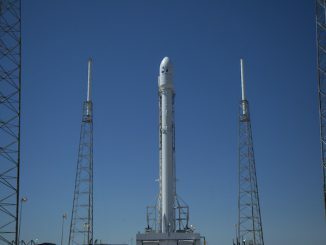 SpaceX called off the launch of a Falcon 9 rocket from Cape Canaveral on Wednesday to make sure the booster’s supply of super-chilled cryogenic liquid oxygen is cold enough to support the delivery of the 5.8-ton SES 9 commercial communications satellite to an orbit nearly 25,000 miles above Earth. 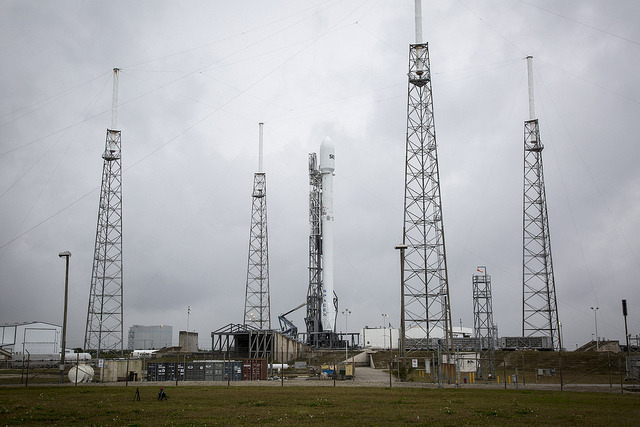 The launch company said the 229-foot-tall Falcon 9 rocket remains healthy after the scrub. Officials decided to delay the mission 24 hours around 6 p.m. EST (2300 GMT), less than an hour before the scheduled launch time Wednesday. “Out of an abundance of caution, the team opted to hold launch for today to ensure liquid oxygen temperatures are as cold as possible in an effort to maximize performance of the vehicle,” SpaceX said in a statement. The launch is rescheduled for 6:46 p.m. EST (2346 GMT) Thursday, at the opening of a 97-minute launch window. There is an 80 percent chance of favorable conditions for Thursday’s launch attempt, according to the official launch weather forecast issued by the U.S. Air Force’s 45th Weather Squadron. The chief concern is brisk winds out of the west-northwest predicted to gust up to 22 mph. The Falcon 9’s limit for ground winds is 30 mph. Otherwise, forecasters expect partly cloudy skies, good visibility and a temperature of 55 degrees Fahrenheit. The Falcon 9 rocket poised for SES 9’s launch is the second flight of an upgraded model of SpaceX’s booster using colder-than-normal liquid propellants. The modified Falcon 9 consumes a super-chilled propellant mix that allows engineers to load additional fuel into the rocket. 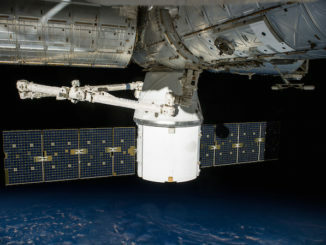 The cryogenic liquid oxygen is chilled closer to its freezing point, from minus 298 degrees Fahrenheit to minus 340 degrees, while the Falcon 9’s RP-1 fuel — a refined form of kerosene — is cooled from a standard room temperature of about 70 degrees Fahrenheit to 20 degrees, according to Elon Musk, SpaceX’s founder and CEO. The change essentially allows engineers to load more propellant mass into the the volume of the Falcon 9 fuel tanks, which are also slightly enlarged on the upgraded rocket. The denser fuel mix flows faster into the rocket’s Merlin engines, adding extra thrust to haul heavier satellites into orbit and leaving leftover fuel to attempt landings of the booster for future reuse. The first stage’s nine Merlin 1D engines collectively generate 1.5 million pounds of thrust at sea level, up from 1.3 million force-pounds on the earlier version of the Falcon 9. SpaceX engineers struggled to master the handling of the super-cold densified propellants at the Falcon 9 launch pad before the first flight of the upgraded rocket in December. The launch team loads propellant into the two-stage rocket in the final half-hour of the countdown, several hours later than the point when fueling occurred in the countdowns of previous Falcon 9 launchers. 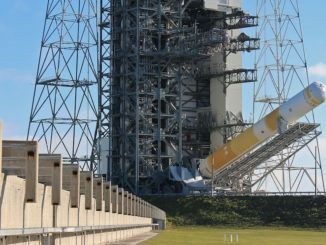 The late propellant load leaves little time for the densified fuel and oxidizer to warm up in the warm ambient weather in Florida, ensuring the propellants remain at the proper temperature for liftoff. Keeping the liquid oxygen and RP-1 fuel at the correct temperatures is vital to exploiting the benefits of the upgraded rocket. The SES 9 satellite needs almost all the performance of the Falcon 9. With a launch mass of 11,620 pounds (5,271 kilograms), the Boeing-built communications spacecraft is heading for geostationary transfer orbit with a high point of approximately 24,400 miles (39,300 kilometers). SpaceX has programmed the Falcon 9’s upper stage to burn its Merlin vacuum engine until its fuel tanks are nearly empty, a late change in the SES 9 launch profile to put the satellite into the highest orbit possible, reducing the satellite’s own workload to put itself into a final orbit nearly 22,300 miles (nearly 36,000 kilometers) over the equator. Owned by SES, the world’s largest commercial geostationary satellite operator, SES 9 is beginning a 15-year mission television broadcasting mission over the Asia-Pacific. The first stage of the Falcon 9 will attempt a landing on SpaceX’s rocket recovery barge in the Atlantic Ocean about 400 miles (650 kilometers) east of Cape Canaveral. Officials do not expect a successful landing because the first stage booster will reach a top speed of up to 5,600 mph (9,000 kilometers per hour), nearly twice as fast as the Falcon 9 first stage that smoothly landed at Cape Canaveral following SpaceX’s last launch from Florida on Dec. 21. The first stage engines will fire a few seconds longer during SES 9’s launch, leaving less fuel on-board to steer the booster toward its landing site. The higher speed puts additional stress on the rocket during re-entry, making it harder to control during descent, and leaving little margin for error.